Two day rainfall amounts of 6 to 10 inches were common across Northeastern Minnesota and northwestern Wisconsin from June 19th and June 20th, 2012. The heavy rain took its toll on the road infrastructure and caused rivers and streams to flood. In the week leading up to the flooding rains of June 19th-20th, parts of northeast Minnesota had received 2-4 inches of rain as numerous storm systems moved across the area. This helped to saturate the soil which primed the Duluth area for runoff in the extreme rain event that we received. On Tuesday, June 19th a cold front that had move through the previous day began to return north as a warm front, setting up stationary just south of Duluth. This front helped provide continuous lift for thunderstorms that developed over east central Minnesota tracking northeast into the Duluth area, the north shore of Lake Superior and into northwestern Wisconsin. The official rainfall in Duluth on the 19th was 4.14 inches. The thunderstorms finally ended when a strong cold front moved through Wednesday afternoon June 20th, but not before dumping another 3.11” at the airport. The official Duluth total rainfall for the event was 7.25”. Duluth International Airport broke several rainfall records during this flooding event. Locally high amounts in the 8-10 inch range were reported throughout Duluth neighborhoods and along the North Shore of Lake Superior. 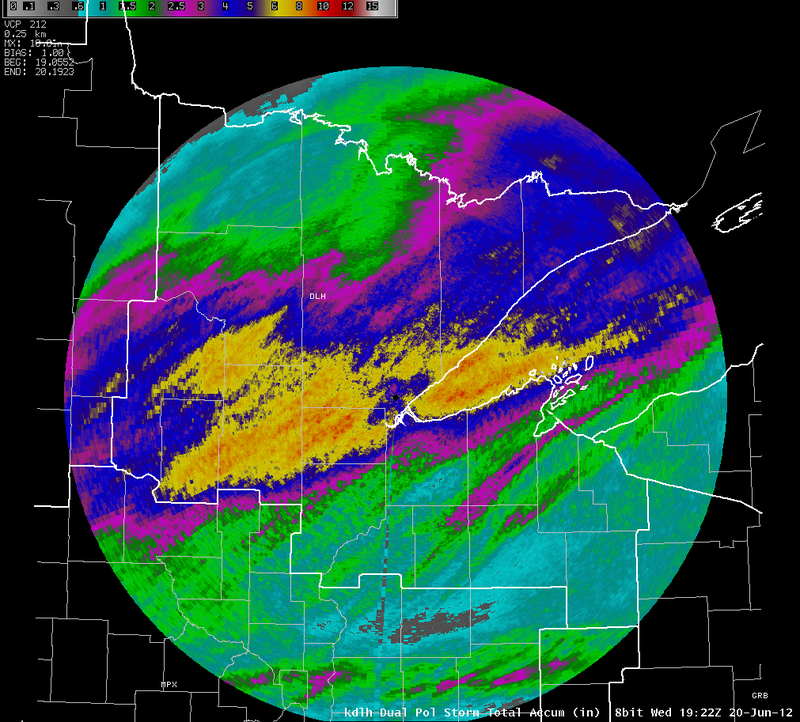 A swath of impressive rainfall amounts ranging from 5-10 inches fell over much of the NWS Duluth area of responsibility during the period of June 19th-20th. Numerous roads were washed out from the deluge of rain from Carlton County through the Duluth metro area and into Douglas County and Bayfield County in Wisconsin. A state of emergency was declared in Duluth, Hermantown, Cloquet, Barnum, Moose Lake and Superior, WI. The steep terrain, and numerous creeks and rivers, played a significant role in the devastating damage and flooding that occurred in the Duluth community. The Fond Du Lac and West Spirit Mountain neighborhoods of Duluth and Thomson Township in Carlton County were evacuated. A raging Kingsbury Creek flooded the Lake Superior Zoo, drowning over a dozen animals. Two seals were swept from their enclosures, but were returned safely after being found on a local street. The polar bear escaped its exhibit, but was safely returned after being tranquilized by a dart. The Chester Creek Dam on the Chester Creek that runs through the heart of Duluth failed during the event. An 8-year-old boy was swept into a culvert while playing in the flood waters in Proctor. He was swept through the culvert for 6 or 7 blocks, but besides some scrapes, was unharmed. Due to the heavy rains and flooding causing water to cover many roadways and even wash out some roads, there are many and significant road closures across northern Minnesota. This is the road closure map at 7:30 am on Saturday June 23rd, and this map will not automatically update on this page. Click on the map to view the most recent information. The NWS office in Duluth did get a chance to see how their new Dual Polarization radar worked during this event. The radar calculated a Storm Total Accumulation based on radar returns throughout the event, and when comparing them to precipitation reports received, the radar calculation seems to be reasonably accurate. Click on the image to get a better look at the radar estimates.